Last night Stuart and I went to see Michael Longhurst's riveting production of New York playwright Amy Herzog's remarkable play Belleville at the Donmar Warehouse in London's glitzy West End. Americans Zack (James Norton) and Abby (Imogen Poots) are bright, young and recently married. He’s a doctor combating infant disease. She’s an actress, also teaching yoga. It’s just before Christmas and they’re living the expat highlife in bohemian Belleville, Paris. And it’s all just a little too perfect. Not only is the story remarkable in the way it unfolds but a twisting, urgent, powerful and an unsettling watch. Things start out nicely enough between the two but as the plot is revealed and their characters start to display their true natures the tension racks up. It’s a tension that will snap and blow their idyllic lives apart in a spectacular fashion. 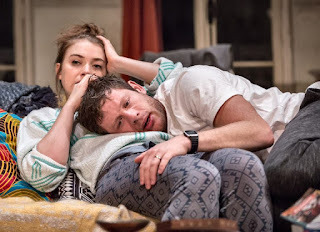 James Norton and Imogen Poots have fizzy chemistry as the 'happy' couple, Faith Alabi and Malachi Kirby are perfect as the neighbours, and the action all takes place in Tom Scutt's note-perfect Parisian set. Coming in at 1 hour 40 mins straight-through it could be seen as an interesting companion piece to Dave Eldridge's wonderful play Beginning. Not that the couples in either play are in any way related per se but whereas Dave E tells us a beautiful story of two people's initial attraction, hopes, and desires in a small flat in Crouch End Amy H's play tells us how in similarly small flat in Paris 5 years on a couple’s attraction can turn to jealousy, their hope to despair, and their desire to murderous hatred. I see it less of a sequel and more as a theatrical warning of marriage! Perhaps the notice in the foyer last night should have told us all be needed to know, "Belleville contains adult themes and scenes that some may find upsetting. It is not suitable for those under the age of 15."